Reassemblage (1983) by Trinh T. Minh-ha was shot in Senegal, and features conventional, even touristy, footage of Fulani work and play. Village settings and activities such as food preparation, weaving, and blacksmithing comprise much of the action. Repeated scenes of women pounding grain conveys the endlessness of women's work. A series of close-ups of faces emphasizes the watchfulness of the ethnographer as the film nears its conclusion. What makes Reassemblage so unusual and arresting is its editing, which mixes multiple jump cuts with unexpected moments of silence and fades-to-black. 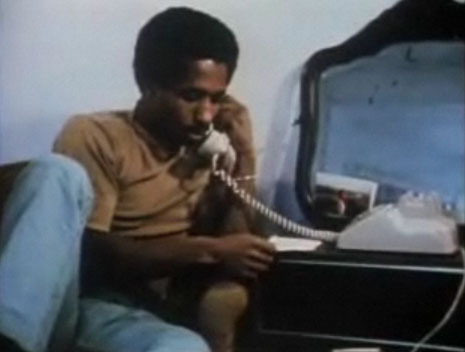 A spare, elliptical narration questions the purpose and objectivity of ethnographic filmmaking. Andy Warhol's Empire (1964) is an eight hour motionless shot of New York's Empire State Building, filmed by Jonas Mekas from the 41st floor of the Time-Life building. Perhaps the scratches and smudges on the film's emulsion lend some visual variety, but what is really interesting about the film is its strange connection to all the videos taken of the twin towers of the World Trade Center on the morning of September 11, 2001. Home video and news footage on that morning held long static shots of the tops of the skyscrapers before they fell; seeing Empire is a reminder of those 9/11 images. Robert Frank and Alfred Leslie's Pull My Daisy (1959) is not a documentary, but the film's setting and characters make it a worthy document of New York's Lower East Side beats, artists, poets, and musicians. Peter Orlovsky, Gregory Corso, and Alan Ginsberg (top still) are among the actors. That's Ginsburg, in close-up, in the second still. An improvisational, wise-cracking narration is by Jack Kerouac. As in Robert Frank's book of photographs, The Americans, Pull My Daisy occasionally uses American flags to add an ironic touch (third still). Every Little Step (2008), by James D. Stern and Adam Del Deo, documents the auditions and casting for the Broadway revival of A Chorus Line in 2006. Baayork Lee (top still, with some of the hopefuls) was the original "Connie" in A Chorus Line. In the second still, she rehearses with Charlotte d'Amboise who is auditioning for the role of "Cassie." The monologue done by Jason Tam, playing "Paul," elicits a heartfelt positive reaction from the producers and casting people that is captured well by the camera (bottom still). Marco Williams, in the autobiographical documentary In Search of Our Fathers (1992), follows his efforts to contact his long-absent dad. 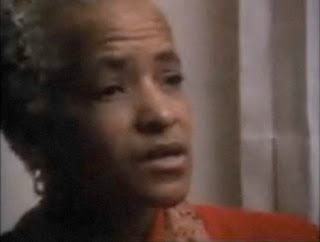 But it is also a loving tribute to Williams's mother, who is portrayed as a genuine heroine. Pie in the Sky (1935), by Russell Collins, Elia Kazan, Elman Koolish, Irving Lerner, Ralph Steiner, and Molly Day Thatcher (Kazan's wife at the time), is a Depression-era oddity that looks like it was made for fun by a group of friends. Two men (above; Elia Kazan, at left, in an unusual on-screen appearance, plays one of the men) horse around in a junkyard after leaving a preachy soup-kitchen that ran out of pie before they could be served. 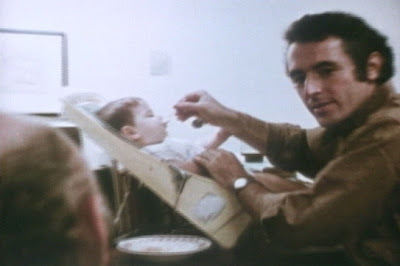 Although Pie in the Sky isn't a documentary, Steiner's shooting style is reminiscent of his work for Pare Lorentz in the documentary film, The Plough that Broke the Plains (1936). Photographer Walker Evans (1903-1975) went to the South Seas on a sailing ship in 1931 and 1932. Travel Notes (1932), is a 12 minute long series of scenes from the ocean trip, including a stop in Tahiti. Using 35mm motion picture film, Evans creates abstract compositions out of sails, rigging, and crew. Michael Moore's Bowling for Columbine (2002) is well-made and watchable, with a passionate sense of inquiry and outrage that is characteristic of Moore's personal approach to making movies. The confrontation with Charlton Heston (above) uses the techniques of activist Kenzo Okuzaki in The Emperor's Naked Army Marches On. 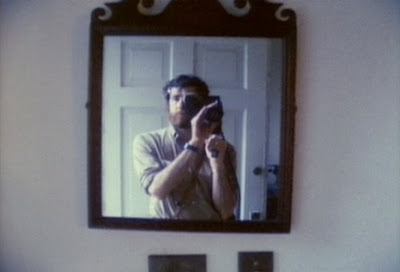 Sherman's March (1986), by Ross McElwee, has the characteristic humor and narcissism of the skirt-chasing personal autobiography film, a genre that includes David Holzman's Diary (a mockumentary). 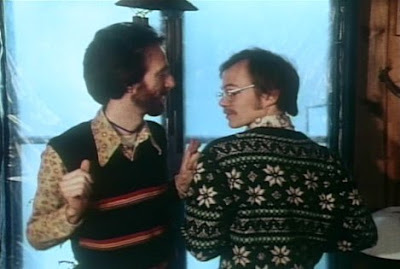 The filmmaker, carrying both a 16mm film camera and audio recorder, is a one-man crew, so many conversations in the movie have a striking realness and intimacy. 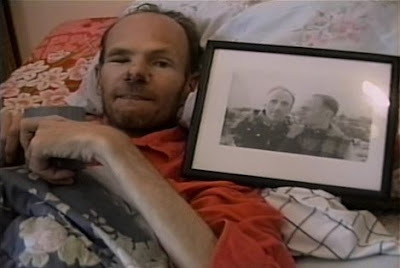 Silverlake Life: The View From Here (1993), by Peter Friedman and Tom Joslin, has had a lasting impact on documentary filmmaking, especially the personal narrative doc. 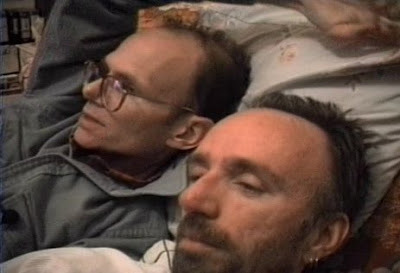 The film beautifully and heartbreakingly edits together home videos of a gay couple (the footage begins in 1989) during their inexorable AIDS related decline. Joyce Chopra recorded her transition to motherhood in Joyce at 34 (1972), from the quiet days of late pregnancy to toddlerhood. 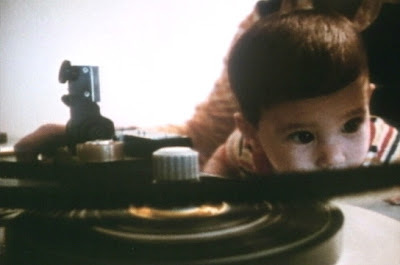 Claudia Weill, shooting much of the film, perfectly captures the impossibility of parents getting any work done while looking after a baby. Chopra's husband Tom Cole (top still) tries to have a meeting while spoon-feeding their daughter, for example. The scene of Chopra (bottom still) editing a film with the baby in her arms is beautifully framed. Alfred Clah made the 16 mm silent film, Intrepid Shadows (1966) as part of John Adair and Sol Worth's filmmaking class with the Pine Springs, Arizona Navajo community. Adair and Worth's 1972 book, Through Navajo Eyes, describes the process of the teaching the Navajo to film themselves and their community. The individuality of Intrepid Shadows sets it apart from the other Navajo films made for Adair and Worth's project. Does the imagery, motion, and feelings expressed in the film derive from Alfred Clah's personality or from the cultural attributes of the Navaho?